Inbound Marketing vs. Outbound Marketing? How About Allbound! In 2006 we saw a major shake-up in marketing with the creation of inbound marketing. Starting with the founders of Hubspot with some Seth Godin mixed in. Inbound marketing showed that if you can create relevant content consistently, buyers will come to you, engage with you, and soon become new customers leading to revenue gains. Let’s be honest who doesn’t like inbound leads? Who doesn’t like someone coming to you and telling you they are interested in your product or wanting to be on your email newsletter? I love inbound marketing and practice it diligently but if you are solely relying on inbound for your business, you are in trouble! Here is why………. Let’s say you are an established company and have been around for a long time and have a built in customer base, inbound should account for about 60 percent of your sales. The other 40 should and must come from outbound related activities. It is absolutely important for companies to apply the outbound model in addition to their inbound marketing efforts. With inbound you lose control of who you want to reach out to, let’s say you have a list of target companies in your territory who you want to engage with, with no outbound system, you would have a very small chance of engaging with those potential customers. Another issue with inbound are the deal sizes. A lot of inbound leads our low dollar sales or window shoppers. Inbound also takes a very long time to get going, to build a subscriber list and to get big time search rankings on google takes years to get going. However with all that said, it is absolutely crucial fort you to have a solid inbound engine. Consistency with blogging, creating phenomenal content, and nurturing your subscribers. The inbound marketing engine is absolutely unstoppable and a must for any company. Jeb Blount states “ the number one reason for failure in sales is an empty pipeline and the root cause of an empty pipeline is the failure to consistently prospect“. 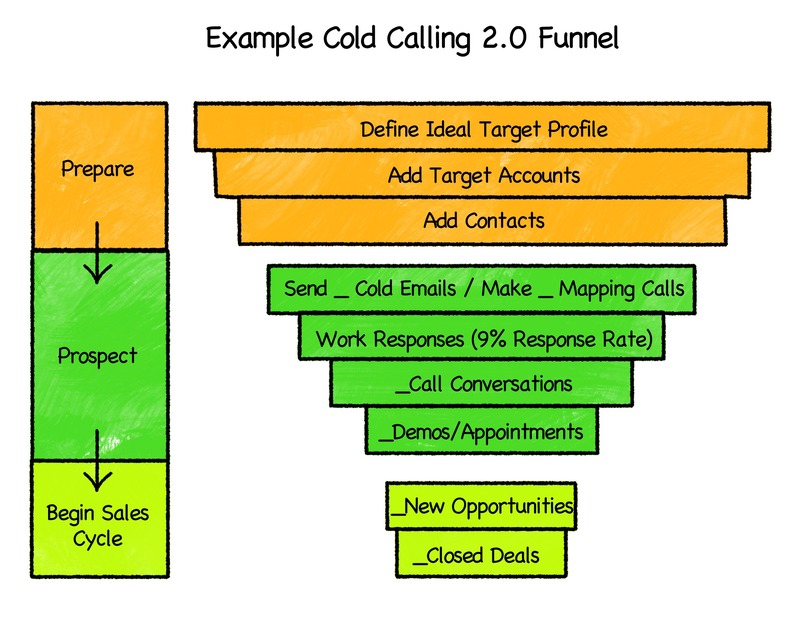 You read everywhere in sales and marketing that cold calling is dead. That nobody picks up the phone, that is takes so many touches to reach someone, that direct mail is a waste and expensive. I believe the reason so many people say cold calling is dead is because most people are not trained on how to properly prospect over the phone and there is a comfort level focusing on pulled in marketing tactics than interrupting someone’s day. The truth is cold calling, social selling, cold emailing, and direct mail absolutely DO WORK! It all comes down to how relevant your messaging is. With the right message you can cut through the robo-spam noise and properly engage with new prospects and build a large base. Use a multi-touch cadence, call them and ask them what are some challenges they are facing in the xyz industry and how you can help. You don’t have to start selling immediately, you don’t have to always ask for the appointment even, ask questions to get more information and send them some relevant content from your company that acknowledges there need. Call them and email them to set up a time to have a meaningful conversation which leads to another commitment or meeting. See, it is all about having meaningful conversations on the phone, not moving fast through a call list or getting burned out on the phone. The more meaningful conversations you have the bigger pipeline and the more sales you will get. When you send a series of cold emails with relevant messaging and the prospect responds, pick up the damn phone and call them immediately. That will lead to a “meaningful conversation” and you are not spammer but someone who can help them and educate them. Connect with your prospects on Linkedin, post relevant content so you can be viewed as an authority and take the conversation offline. 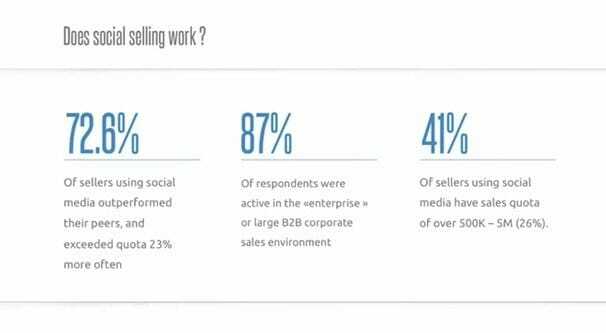 I believe social selling is the perfect mix of outbound business development and inbound marketing. Social selling is another amazing avenue to properly engage with prospects to get appointments and nurture your audience. The key to social selling that so many sales reps get wrong is they ask for something immediately. They send an inmail asking for the appointment right after they connect. Why would someone respond to them when you haven’t shown them any value? However not everyone is active on Linkedin and Twitter and you are not able to share or like there content. When that happens there is only one thing you can do…PICK UP THE DAMN PHONE! Smiling and dialing is dead, but be strategic and find great targets. Having conversations on the phone is the quickest way to get people moving along the pipeline. At the end of day it’s not inbound it’s not outbound, its allbound!! Write blog posts, create great content, post on social, nurture subscriber lists, call relevant prospects, use multi-channel follow ups (email, social, phone) have great cold email messaging and engage prospects on Linkedin. Allbound is the proven way to get more prospects through the pipeline and into long standing customers for your business. Next time someone says something doesn’t work or some sales tactic is dead, the smart thing would be to keep moving because if you are relying on one thing you are setting yourself up for mediocrity. If you use all methods into your repertoire you will always be ahead of the game.